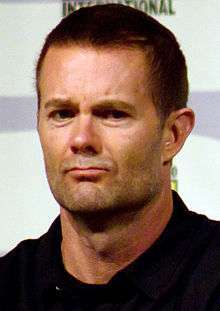 Garret L. Dillahunt (born November 24, 1964) is an American actor. He is best known for his work in television for the roles of Burt Chance on the Fox sitcom Raising Hope, Ty Walker in the sixth season of Justified, a terminator in Terminator: The Sarah Connor Chronicles, Matthew Ross in The 4400, Jack McCall in Deadwood, and Steve Curtis in ER. In film, Dillahunt has played many major supporting roles in the famous films The Believer, No Country for Old Men, The Assassination of Jesse James by the Coward Robert Ford, The Last House on the Left, Winter's Bone, Looper, and 12 Years a Slave. He is currently starring in The Mindy Project and the Amazon Studios drama Hand of God. Dillahunt was born in Castro Valley, California, and grew up in Selah, Washington. He has two brothers, Brett and Eric; Eric died in 1981 in Yakima, Washington, as the result of a drunk driving accident. Garret graduated from the University of Washington with a B.A. in journalism and received his M.F.A. in acting from New York University's Graduate Acting Program at the Tisch School of the Arts. After spending years on and off Broadway, Dillahunt began pursuing television and film roles. He appeared as a regular in several short lived series on ABC and Showtime, and landed guest spots on TV shows such as The X Files and NYPD Blue among others, before playing two distinctly different characters on the HBO series Deadwood: Jack McCall in 2004 and Francis Wolcott in 2005. He later had a recurring role on USA Network's The 4400. Dillahunt portrayed Steve Curtis for three seasons on ER (2005–06). Later roles included Dr. Michael Smith on HBO's John From Cincinnati; Cromartie and John Henry on FOX's Terminator: The Sarah Connor Chronicles; Roman Nevikov, a Russian gangster, on NBC's Life; and Mason Turner, a paralyzed serial killer on Criminal Minds. He played Simon Escher in the Burn Notice third-season finale airing March 4, 2010 on USA, later reprising the role in the show's fourth and seventh seasons. Dillahunt appeared in such films as The Assassination of Jesse James by the Coward Robert Ford, No Country For Old Men, The Road, Winter's Bone, The Last House On The Left, TalhotBlonde, and the indie horror film, Burning Bright. From 2010 to 2014, Dillahunt co-starred as Burt Chance on the Fox comedy Raising Hope. He began a recurring role on The Mindy Project in 2015. 1998 Maximum Bob Deputy Dawson Hayes "Pilot", "A Little Tail", "Good Dog Karl"
2006 Numbers Jack Tollner "Provenance"
2007–2009 Life Roman Nevikov "The Fallen Woman", "Trapdoor", "One"
2009 Lie to Me Eric Matheson "Honey"
2009 White Collar Patrick Aimes "Flip of the Coin"
2015 Brooklyn Nine-Nine Dave Majors "Det. Dave Majors"
↑ "Garret L Dillahunt, Born 11/24/1964 in California". californiabirthindex.org. ↑ Garret Dillahunt profile, imdb.com; accessed February 21, 2014. ↑ Garret Dillahunt Biography at Yahoo! ↑ Chris Jones (September 23, 2009). "Garret Dillahunt: The Man Who Disappears". Esquire.com. Retrieved 2009-09-30.